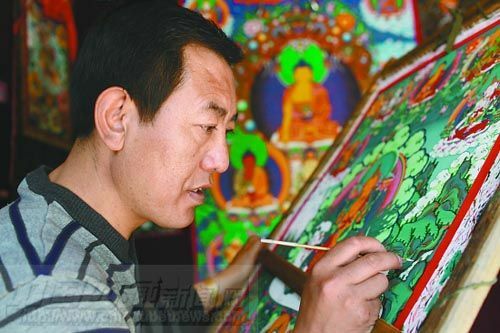 Photo shows the Thangka inheritor Norbu Sida is painting in the studio, May 2. Norbu Sida, as the Minsa sector Thangka inheritor received the participation invitation of 2010 Shanghai World Expo. Minsa sector Thangka was founded in the mid-17th century by the 4th Panchen Lama's personal Thangka master, which absorbed the fine art techniques of central plains, India, and Tibet. In 2009, the Minsa sector Thangka had been selected as intangible cultural heritage.